The "Future Constitutional Development for Small Island Territories" was the subject of a lecture at the 2015 Global Institute for Leadership Management and Strategic Development of the University of the Virgin Islands (UVI) held on the St. Thomas Campus of (UVI). The lecture was delivered by Dr. Carlyle Corbin, International Advisor on Governance and Multilateral Diplomacy, and former U.S. Virgin Islands Representative for External Affairs. The presentation began with a review of key United Nations General Assembly resolutions and declarations which contribute to the overall international framework for the constitutional and political evolution of dependent territories leading to the full measure of self-government according to global standards. An important focus of the lecture was its highlight of the specific political status options recognized under international law as providing for a full measure of self-government. 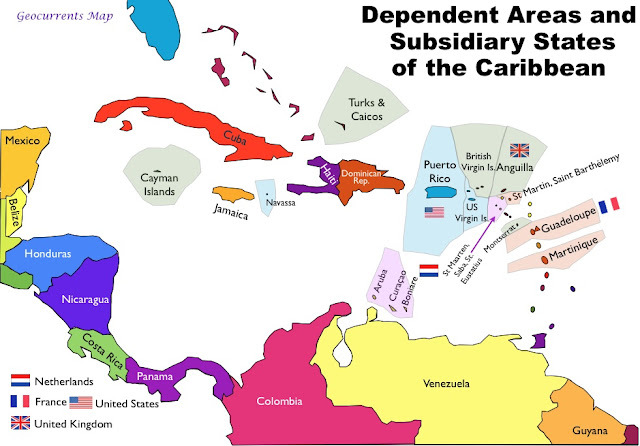 According to Corbin, these options have emerged through a process of modernization of former dependency constitutional arrangements in place in former small island territories of the Caribbean and Pacific under varying constitutional arrangements with larger countries. "These options remain very much available to the remaining dependencies at this juncture a decade and a half into the 21 st Century," he noted, "and these models of full self-government can emerge through a genuine process of self-determination in which the people make an informed decision after a comprehensive and sustained public information programme." The lecture contrasted the present models of dependency governance in play in the Caribbean and Pacific regions under the administration of the British, French, United States, and other 'administering States.' In the Caribbean, these include the six British and two U.S. - administered territories, namely, Bermuda, Turks and Caicos Islands, Cayman Islands, Montserrat, British Virgin Islands, Anguilla, Puerto Rico and the U.S. Virgin Islands. In the Pacific, these include the Pacific dependency governance models of U.S. - administered American Samoa, Guam (Guahan) and the Northern Mariana Islands; French - administered New Caledonia (Kanaky) and French Polynesia (Ma'ohi Nui); and New Zealand-administered Tokelau. Corbin explained that the United Nations General Assembly adopts annual recommendations specific to each of these seventeen remaining dependencies. He indicated that "in the of Puerto Rico which is not formally listed by the U.N., full committee hearings are conducted each June where close to 100 speakers from that territory's government, political parties and civil society, along with independent scholars and others, provide their perspectives on the future options for Puerto Rico." "Emanating from this process, he said, is an annual committee resolution which includes a host of recommendations on economic, social and political development; and which calls for the issue of Puerto Rico to be taken up by the U.N. General Assembly. In his lecture, Corbin made specific comparisons between the dependency governance models in place in the two regions and other constitutional arrangements which provide for either the exercise of autonomous governance, or governance through integration with countries outside the two regions. In this connection, he reviewed the Dutch autonomous models in play in Aruba, Curacao, and Sint Maarten; and the French collectivity models in St. Martin and St. Barts. The French integrated departments of Guadeloupe, Martinique and French Guiana were also explored, along with the 'partial integration' model in place in Bonaire, Sint Eustatius (Statia) and Saba which are presently under mandatory five-year review. As Advisor to the Statia 2014 referendum process, Corbin shared specific insights on the implications of the outcome of that process where the majority of the voters elected to replace the 'partial integration' political status with an autonomous governance model. "This initiative can have potential implications for a possible referendum under consideration in Bonaire, the second of the three jurisdictions in partial integration with Holland," he indicated. (The third territory in partial integration is Saba). In the context of the wider hemisphere, reference was also made to the Pacific jurisdiction of Easter Island (Rapa Nui) and the Western Caribbean jurisdiction of San Andres in their respective political relationships with Chile and Columbia. On the Pacific side, the lecture explored the U.S. model of free association in place in the Federated States of Micronesia, Marshall Islands and Palau which had emerged at the beginning of the 1990s out of the former U.N. Trust Territory of the Pacific Islands following World War II. The associated state models in place in the Cook Islands and Niue vis a vis New Zealand were also examined with specific reference to the wide areas of devolved power enjoyed by the two respective associated states. Corbin considered that "the New Zealand autonomous model in the Cook Islands and Niue, as well as the Danish autonomous model in Greenland and the Faroe Islands, were among the most enlightened examples of modern autonomous governance." During the presentation, the governance advisor made periodic reference to the international 'Self-Governance Indicators (SGIs)' developed in 2011 for the purpose of assessing the sufficiency of self-government of the small island dependent, autonomous, and integrated jurisdictions. Corbin explained that "the Indicators are utilized as a diagnostic tool in conducting comprehensive self-governance assessments in various jurisdictions in the Caribbean and Pacific to measure the level of self-government being exercised, the extent of unilateral power of the larger administering State and the nature of any democratic deficits that may be present in the specific governance model." An important element of the lecture was the relationship of global events and the strategic location of a number of the dependencies, particularly those in the Asia/Pacific region. In this connection, Corbin made ample use of maps and other illustrations to indicate the "geo-strategic and geo-economic sensitivity of many of the jurisdictions, particularly those in the Asia/Pacific region, where much attention is being paid to the emergence of China as a growing world power, and the question of the ownership of the undersea mineral resources of the Pacific region, particularly in areas such as French Polynesia." The lecture on "Future Constitutional Development for Small Island Territories" was preceded the previous day by an address on "The United Nations at 70 - Future Challenges to Global Governance." Corbin, who serves as the Executive Secretary of the Council of Presidents of the U.N. General Assembly, noted that "the year 2015 marks the 70th anniversary of the founding of the United Nations (U.N.) which has become the pre-eminent world body comprising 193 countries." Accordingly, the presentation examined the evolution of the U.N. system of organizations, explored the U.N. role in addressing international issues, and identified some of 21st Century challenges facing global leaders including sustainable development, war and peace, nuclear non-proliferation and more. The lecture reviewed the plans of action adopted by global leaders at U.N. conferences aimed at addressing many of these challenges. Both lectures provided for substantial interactive dialogue with the participants.